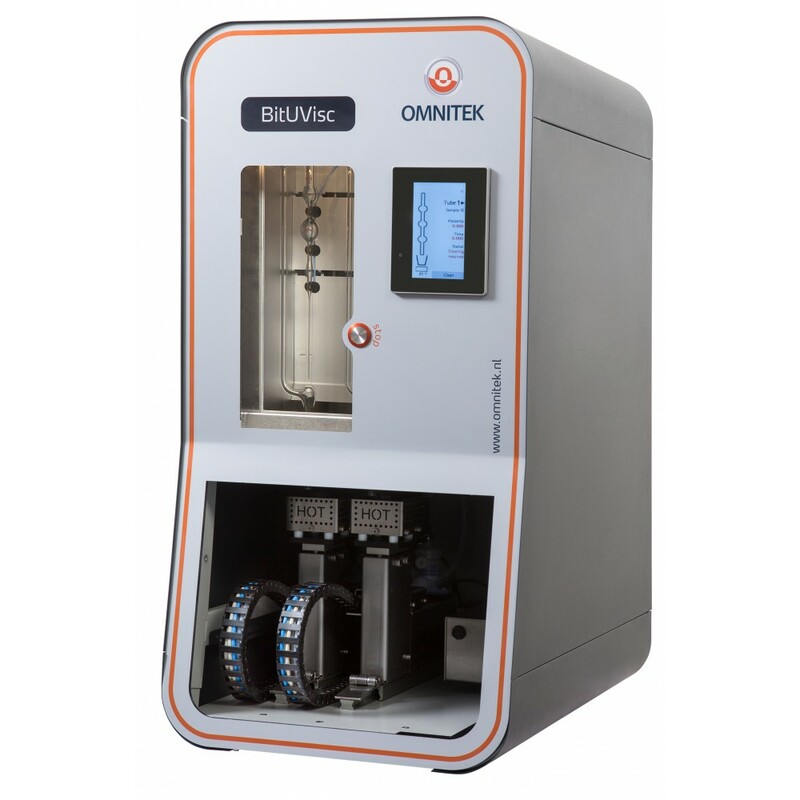 Omnitek BitU-Visc Automatic Viscometry System – Koehler Instrument Company, Inc.
Kinematic viscosity characterizes flow behavior. This method covers the procedure for the determination of kinematic viscosity of liquid asphalts, road oils, and distillation residues of liquid asphalts at high temperatures. Applicable for fuels, base oils, formulated oils, highly viscous samples like vacuum residues, additives, crude oils, waxes, heavy fuel oils, polymers, asphalts, etc. 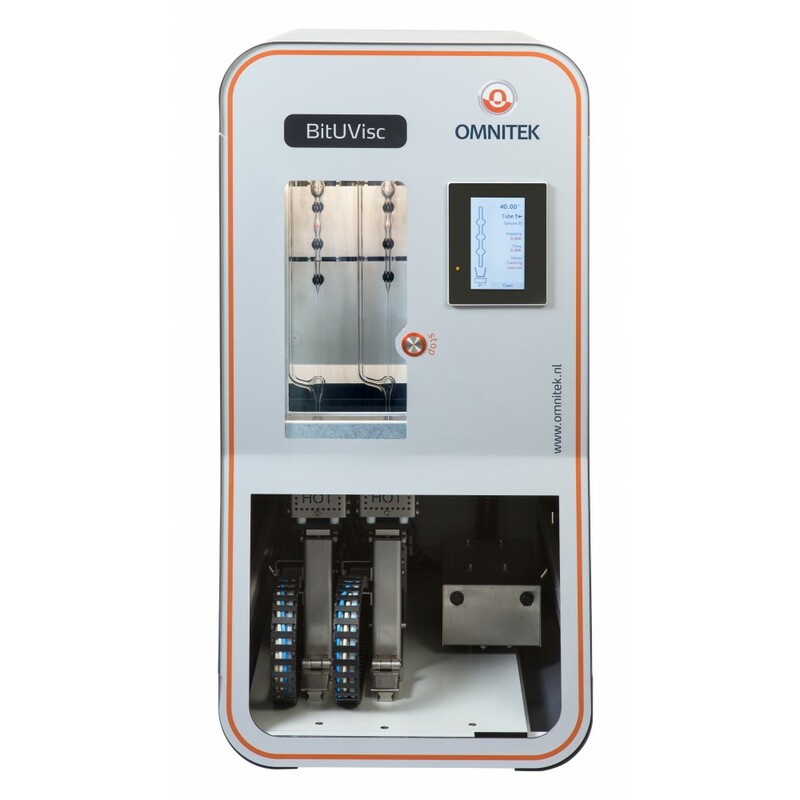 The Omnitek BitU-Visc is a programmable, fully automatic kinematic viscometer specially designed to handle highly viscous samples at high temperatures. The system can process samples with viscosities ranging up to 120,000 mm2/s, up to 150 C.
There are 2 different models available: BituVisc 110 features a single thermostatic bath with 1 viscometer tube whereas the BitU-Visc 120 model holds 2 viscometer tubes in a single bath. All BitU-Visc instruments are equipped with auto-sampling, preheating, fully automatic dual solvent cleaning and drying. The viscometer tubes are based on the well-known and proven Ubbelohde design. Using specially designed thermal sensors, these tubes allow the detection of fully opaque fluids without any problems or limitations and eliminate the need to use reverse flow tubes. The standard configuration offers viscosity measurement up to 150 C and sample preheating up to 200 C.
Sophisticated temperature control ensures that measurements are carried out well within the required temperature stability. The system features an innovative single position auto-sampling which provides integrated heating of the sample up to 200 C and uses preheated solvent to effectively clean the viscometer tube. The BitU-Visc is fitted with specially designed duplo viscometer tubes for unstable samples such as vacuum residues, additives, crude oils, waxes, heavy fuels oils, polymers, asphalts, etc., which typically show poor determinability when sampled repeatedly. These tubes have 2 measuring sections with an approximately similar tube constant. This allows for an actual duplo determination while only sampling once. The BitU-Visc requires a PC (not included) for full operation and can be controlled through an advanced PC software application but it can also be controlled as a stand-alone unit through the responsive color touchscreen interface with a storage up to 10,000 measurement results. The PC software allows the operator to specify optimized and fully customizable test methods for each individual sample. For data collection, storage, calculations, and reporting, an advanced PC application is provided with the instrument, which can gather data from up to 4 instruments simultaneously. THe BitU-Visc utilizes advanced and easy to use multi-lingual software. One PC can control multiple systems (1 COM-port required for each instrument). Data can be exchanged with a LIMS via RS232 or optionally via wireless. The instrument can be operated in its entirety through the PC interface. Sample ID's can be loaded and sample queues can be started, halted or temporarily suspended. Results are automatically stored in the internal database and optionally also on any external drive or network folder. During a run, several kinds of information is shown like measured flow times (average and corrected), % difference, viscosity result, bath temperature, set temperature, preheater temperature, sample ID, test method, measuring section and last results. Also, actual status like filling, cleaning, etc., is shown for every unit involved. Measured flow times are presented in left or right column, depending whether upper or lower measuring bulb is used for testing.